Each player in Träxx has an erasable game board that features lots of colored hexagons shaped into a larger hexagon, with the numbers 2-10 being scattered across this playing area. While the color and number arrangement is the same on all player boards, the starting point differs on each board. 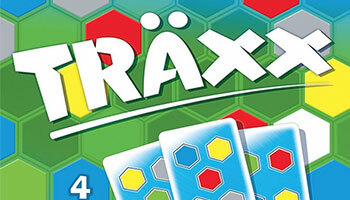 To play, shuffle the deck of fifteen cards, then reveal the top card, which will show four or five colored hexagons. Playing at the same time, each player takes an erasable pen and draws a path on their game board - with this path starting at or at least passing through the starting point on their board - that covers up to as many hexagons as were revealed, with the colors of the hexagons in your path matching those shown on the card. Thus, if the card shows two gray hexagons and one each of blue, red and yellow, then your path can cover at most two gray hexagons and one each of blue, red and yellow. Once all players have drawn their path, reveal the next card, continuing the path in either direction and covering only as many hexagons of the proper colors as is shown on that card. A path cannot cross itself. When your path crosses a number, call out that number. If you're the first one to reach it, you'll score that many points at game end; if others have reached it first, you score half this many points, rounded up. Once you've finished all fifteen cards, the game ends and you lose one point for each space not covered. Whoever has the highest score wins! Throughout the course of the game each player develops (draws) a path on his board. The path consists of a continuous line. The line may not be interrupted, intersect or touch itself. Each round, the path can be extended at one of its ends only.